As a 2-in-1 car seat the CYBEX Pallas-fi x can be used for more than 11 years, covering your child from nine months to 12 years. In Group I, Pallas-fix features an revolutionary adjustable safety cushion. The force of a collision is distributed over the entire safety cushion and reduced by its impact absorbing materials. This system resembles a blown-up airbag and helps to reduce the forces significantly. When the child is approximately three years of age (15 kg), the seat easily converts into award winning Group II/III seat CYBEX Solution X-fix. The ISOFIX connect system offers enhanced safety and greater stability in both groups. The seat’s connectors simply snap into the vehicle’s isoFiX anchor points. The connectors can be easily folded away making the seat, also compatible with cars not equipped with ISOFIX. For an easyier fastening of the seat using it's ISOFIX connectors there is a pair of ISOFIX guides included in the package. 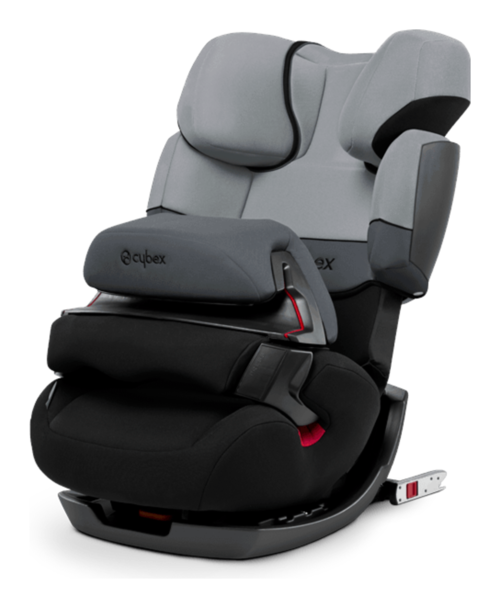 The fixing beld connects the headrest of the car seat and the children safety seat. The guides make car seat installation easier, whilst protecting fabric and leather seating. The guides make car seat instalation easier, whilst protecting fabric and leather seating.